Office Space - Eynsham, Oxfordshire. 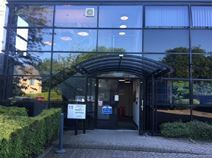 Available furnished or unfurnished these smart, modern, quiet offices range in size from 14m² to 34m² and are ideally located on a business park close to Eynsham, Witney and Oxford. All spaces are individually air conditioned and heated, while there is also access to communal showers and kitchen facilities. Parking spaces are available on-site and there are good road links to and from the business park.